Woolworths have just launched a new range of pork sausages and as we enjoyed these so much on our visit to England in 2009 I decided to try them. 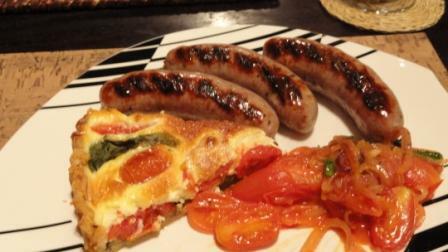 We always have a tomato and onion relish to go with sausages or boerewors and it is so easy to make. a splash of balsamic vinegar reduction - I use a flavoured one! fry on a low heat until the onions are very well cooked but not burnt! hmm like the idea of adding ginger to a tomato relish.. need to try this one ! Have a nice day, Tandy.